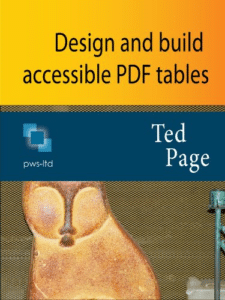 This 5-chapter ebook details the accessibility aspects of the structure, design and layout, content, tagging and testing of tables in PDFs. Although the technical build of the ebook may have aged somewhat, despite now being over 5 years old, the contents of the book and the techniques it embodies remain as relevant today as they were when it was first published. Guide to the essentials of creating accessible PDFs with Microsoft Word and Acrobat Professional 8 (PDF, 229 KB) , Ted Page, November 2007. The world of PDF accessibility has certainly moved on in the decade or more since I wrote this guide for the BBC, as reflected in the content of our Accessible PDFs from Word and Accessible PDFs from Acrobat training courses. However, those starting out in the field should find much in the guide that will still be relevant and of use.